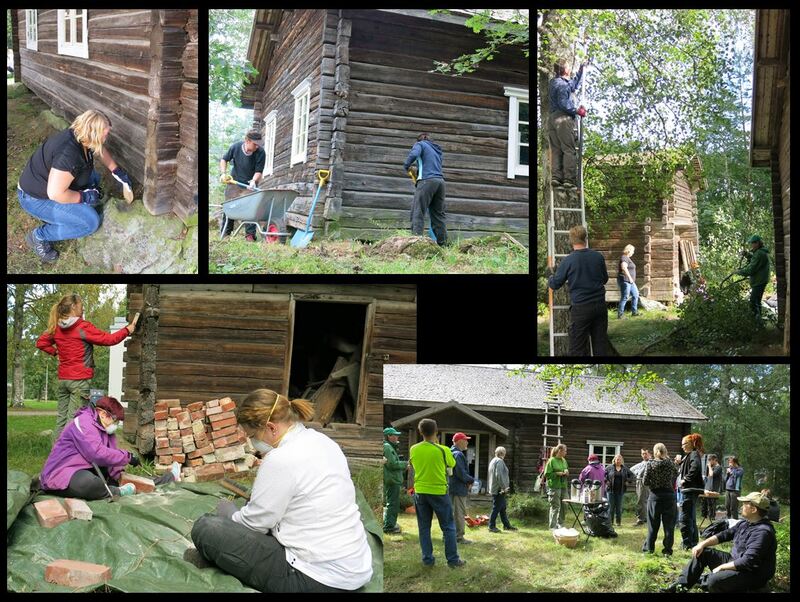 For the second time The Pirkanmaa Provincial Museum organized a cultural environment camp at Valkeakoski, Sääksmäki area. Co-organizers this year were Metsähallitus and the Finnish National Board of Antuquities. 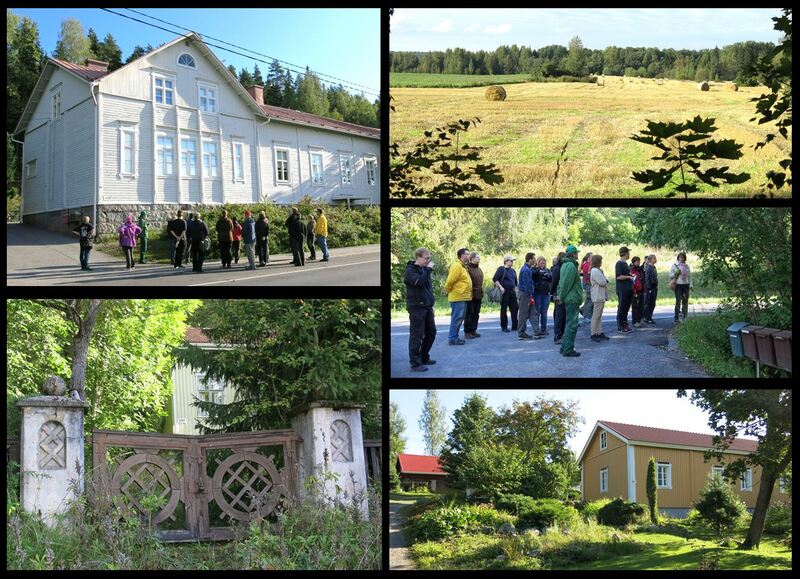 The camp took place in the last weekend of August 29.-31.8.2014 and the place of accommodation, like last year, was Pappilanniemi course center. Twenty archeology, history, and environmental management interested people participated on the camp. The campers ranged in age from 24 to 77 years of age and came from different parts of Southern Finland. On the first day of camp, Friday, we took a guided tour to Rapola castle fort, which offered staggering sunset gilded landscapes to Lake Vanaja. End of the evening we enjoyed pancakes baked over an open fire and familiarized with the group. Saturday morning started with an information packet, which presented the camp organizers and the line of work they do concerning cultural heritage. In addition, the camps work sites and the different chores there were introduced. 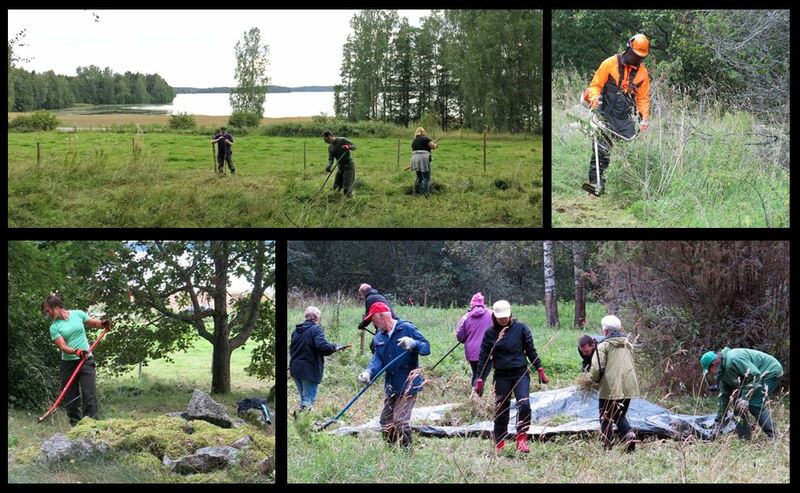 After lunch, the pruning shears were grabbed in hand at Rupakallio ancient burial mound. 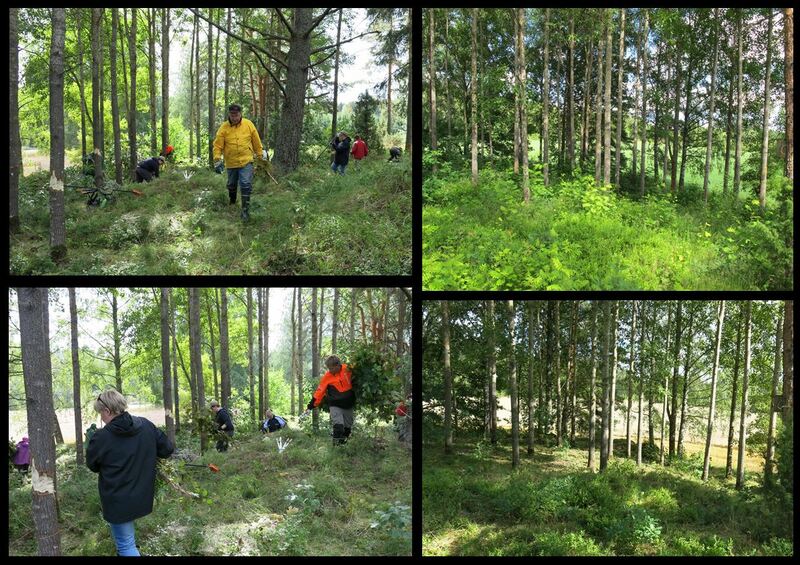 After a couple of hours of cutting the undergrowth and picking up after clearing saw traces the terrain looked completely different. Nice Job all! 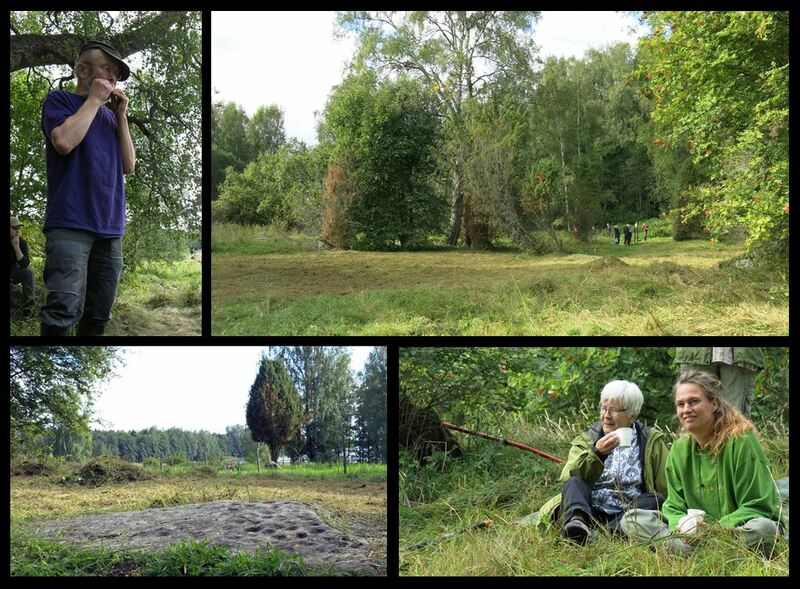 Next was another ancient burial mound at Hirvikallio where tall grass was cut down, undergrowth cleared, and surroundings tidied. There, the results of hard work were even more clearly seen as piles of debris raised well over a meter high and the mown field increased in the eyes. And as always, breaks are an inevitable part of work 🙂 At Hirvikallio one of the campers amazed and entertained everyone by playing with a leaf of a plant. Who knew that was even possible? After a busy day, Saturday evening was spent in sauna, taking a swim in the lake, frying sausages by an outside fireplace and admiring the fireworks provided by the opposite shore cottage owners celebrating the last summer weekend. Sunday began with a brisk walk to the picturesque nearby village of Huittula accompanied by a local guide. 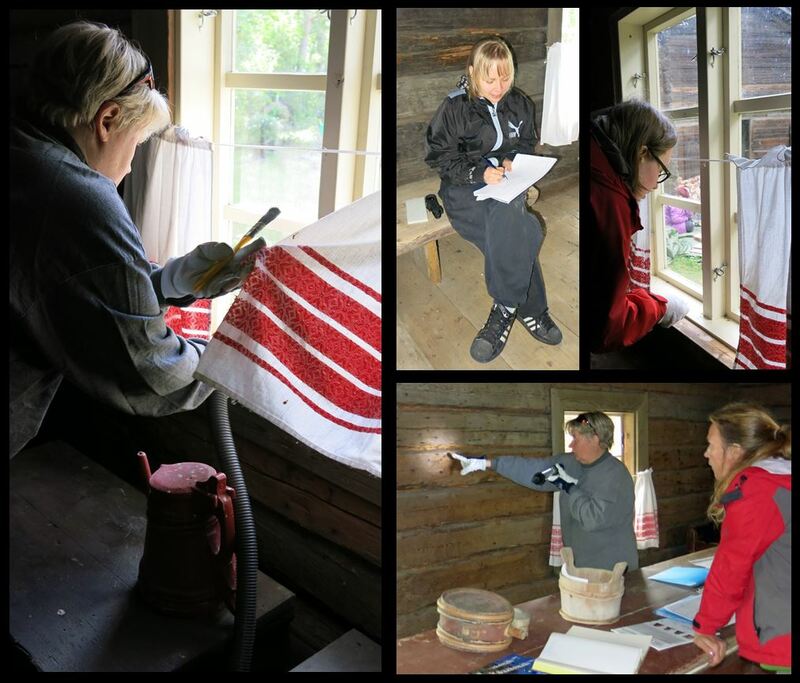 Tour ended at Sääksmäki local history museum, which was the camper’s working place for the day. There, the museum building’s interior was dusted, windows washed and insect damages to the log frame documented. Also, the local history museum’s yard was cleared and different small renovation gigs done to the buildings. Renovation included for example brushing the walls and foundation stones and clearing added ground around buildings. Amazing how much twenty people get done in a matter of hours. Also a small outbuilding standing on the museum yard got new set of stairs. Its old log stairs were badly rotten. They were demolished and new ones resembling the old ones built on their place. 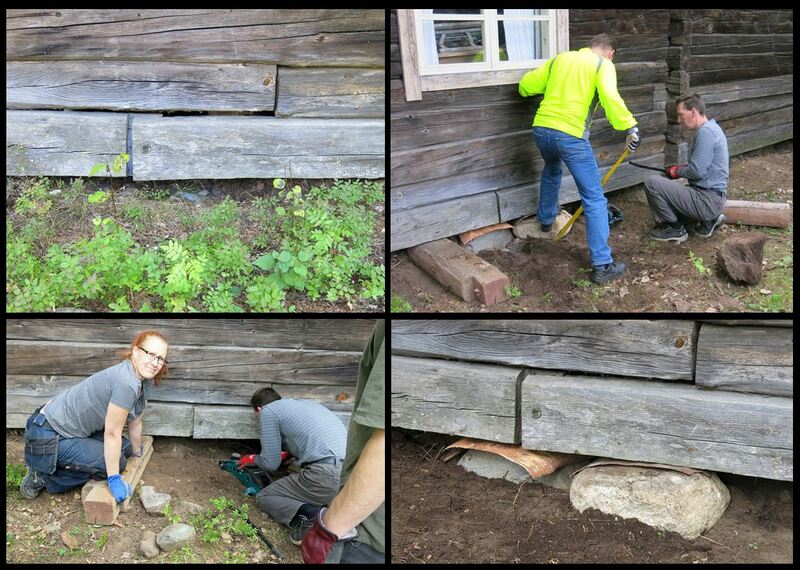 And yet, two logs down the bottom on the museum building had been extended and slightly sunken. Deformation was stopped by placing new support stones. In addition on Sunday, the surroundings of an ancient sacrificial stone situated near the museum and the road Huittulantie were cleared. The stone could be an excellent site for adoption to any of the nearby group of enthusiastic volunteers! Thus, from the organizer’s point of view, the camp was a success beyond expectations. And as far as I can tell, the campers enjoyed as well. Many smiling faces could be seen midst hard work, and on the feedback form the camp received a rating of 9.5 out of 10 maximum!